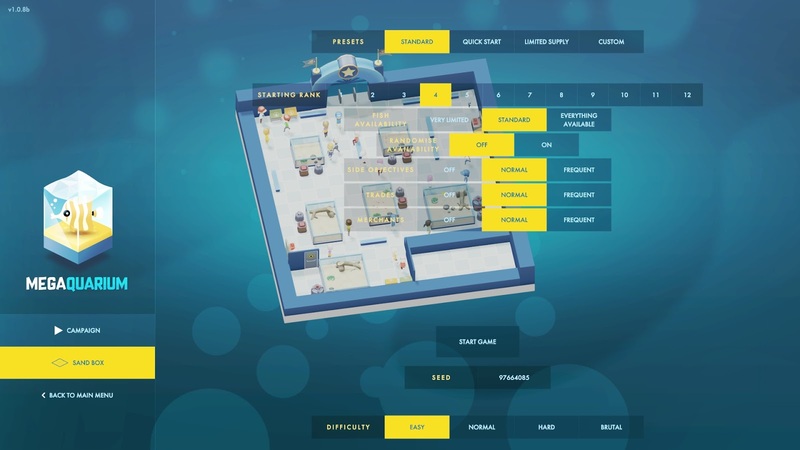 Ever since I can remember I have enjoyed playing simulators, my favourite being theme hospital so when I saw Megaquarium I knew I had to give it a go and lucky enough I was able to play it on my Mac, yes I'm a Mac gamer riddle me all you want it's not much different to playing on PC. 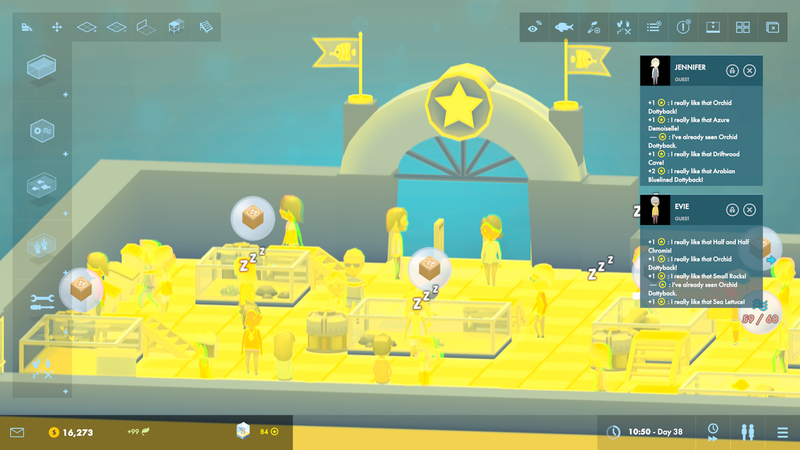 Initially, there was an issue with Megaquarium (which got sorted fairly fast) the colour of the game was an odd yellow and green, I emailed the developer about it and he kept me up to date with when the update to fix the issue I was having would go live which was very kind and shows he cared about the players. Starting up the game takes a while, not sure if it's just for Mac users but the game loads up all the content which is included in the game the longest I have waited for it to start up was about 12 minutes which is kind of frustrating as I wanted to dive in straight away and play but .... said he is working on making loading times quicker on his twitter so he is aware of the loading times! The controls on the game are fairly simple, but whilst playing Megaquarium with a Mac mouse I've realised who sensitive the mouse could be and it would zoom me in and out of the aquarium whenever it felt like it which was no fault of the games. The aim of the game is pretty straightforward, keep the fish alive and happy and the visitors interested enough in order to rank up, the first aquarium I worked on was called Sunnyside, it was the most challenging for me as it was from scratch and I had no idea what I was doing, after a few hours I got used to it and decided to move on to the second option of aquarium you can play as... on this one I found it much easier to have control, there were already tanks in the aquarium I just needed to add more of them along with fish and the right decorations to entice more people to enter. I would find myself fast forwarding through time in order to rank up faster so that I could unlock more equipment, fish, supplies, toilets etc, the game can become a waiting game which may frustrate others but I would leave my aquarium running in the background and come back to it now and then when something needed to be sorted. Fish dying was one of these things, I'm better at keeping them alive now that I follow their needs and don't just plonk them in a tank and hope for the best, some fish aren't able to get along with each other so I would have to find them the right tank for their needs otherwise they end up very unhappy and unfortunately die, you're able to keep track of every fish need by clicking on the tank they're in, if the bar starts going red it means something is very wrong and it's your job to sort it. 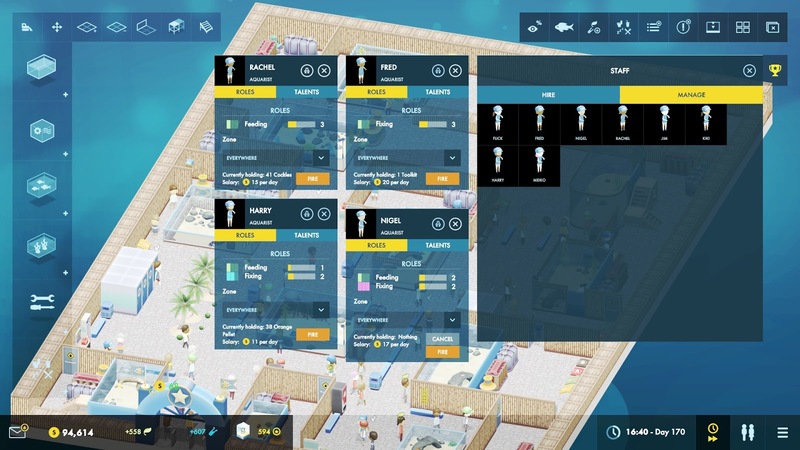 The game relies heavily on marine research, the happier the customers are the more research you can get done, this will unlock a number of features which help you upgrade tanks and equipment as well as new breeds of fish, you won't be able to put new breeds in tanks straight away as you will need to unlock certain features in order to help the fish thrive and live, at one point I unlocked a new aquarium and I was able to add the hermit crab to the tank but I had nothing to feed it with until I unlocked another fish that ate the same food. Each time a customer looks at your tank or sees how clean the aquarium you will get points, the higher the plant life object you put in your aquarium the more points you will get from the customers, at times they are hard to please and if they don't like something your rank points can plummet very quickly. 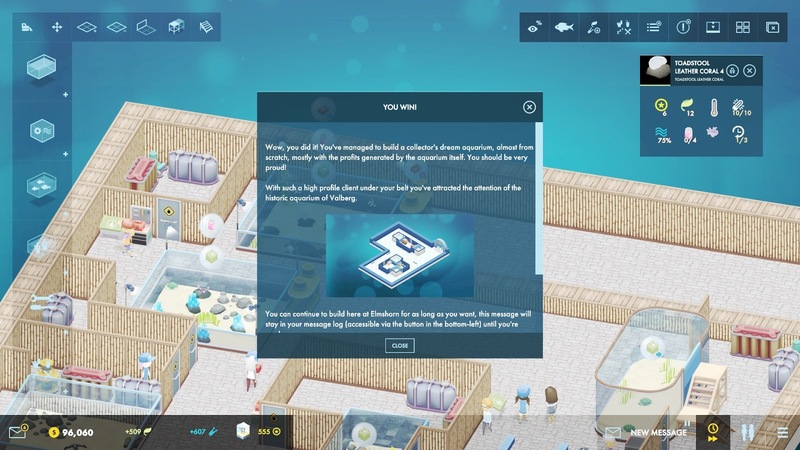 An addition to the game which I liked was choosing from Campaign and Sandbox, campaign challenges you and gives you tasks to complete which is what I enjoy playing more whereas sandbox you can choose your ranking (1-12) and what you want your aquarium to include, essentially it's building with everything included without taking on tasks, the sandbox mode kind lets me know how far into the game I am and how many more features there are to get in the game, right now I'm rank 5 nearly 6 so I'm not far off being halfway through the rankings and already I have unlocked the large equipment already. The staff are one of the most important assets for keeping the aquarium running, they fix broken down equipment, keep it clean and feed the fish. If you have too little your aquarium won't run as smooth as you want it to. 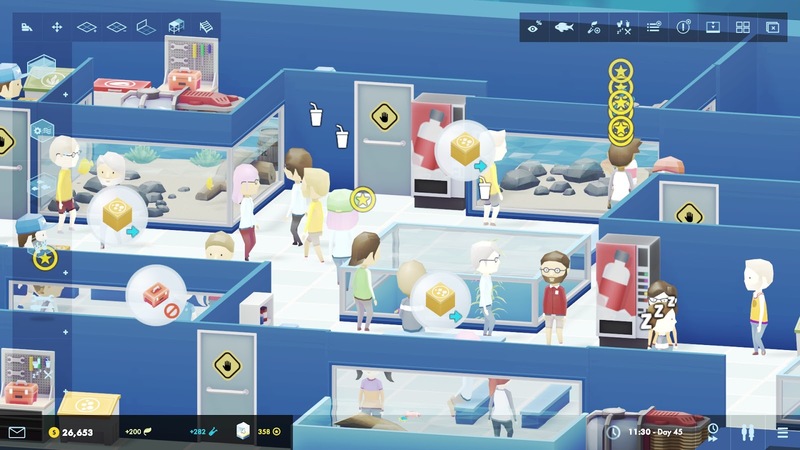 They can be levelled up and learn new skills which will help bring order to the aquarium, you can also give them certain areas which they are in control of, the more fish in a tank the more they are going to need to be fed so having certain staff work in that area where the tank is will stop the fish from dying of hunger. Megaquarium isn't just a game I feel like it can be great for educational purposes, as a kid I would love learning about animals, wildlife, marine life etc and even now as an adult I will happily sit and watch nature documentaries because I find them so interesting, Megaquarium is able to make people understand you can't just plonk a load of fish in a tank together (which I was doing ironically) and hope for the best, it's much more complicated than that. Now one thing I want to mention is some people will find games like this cruel and are against caging and putting animals in tanks but this isn't anything like Seaworld, you are taught to put fish in the right size tank for them, help ever need they have and keep them happy, a lot of places in real life that are like Megaqurium rely on the public to fund research and help these creatures which is something that I'm not against at all. 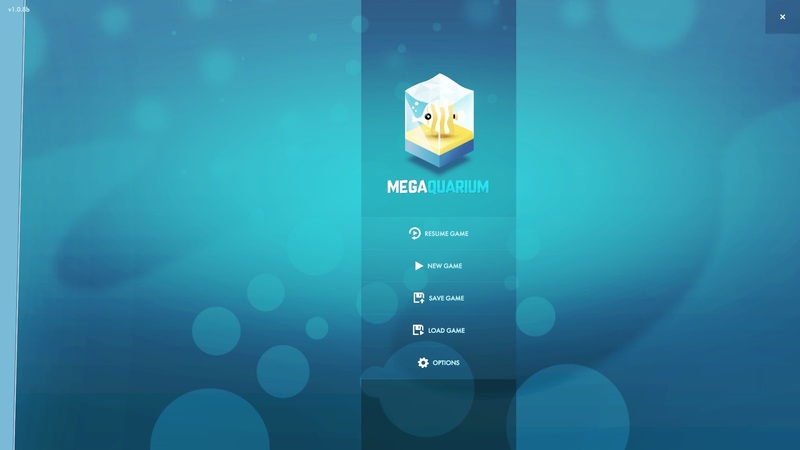 Overall I felt Megaquarium was a great simulator game, takes a while to get used to but can become addictive whilst making you work hard for a higher ranking, this is a game I can see myself playing a lot whilst. 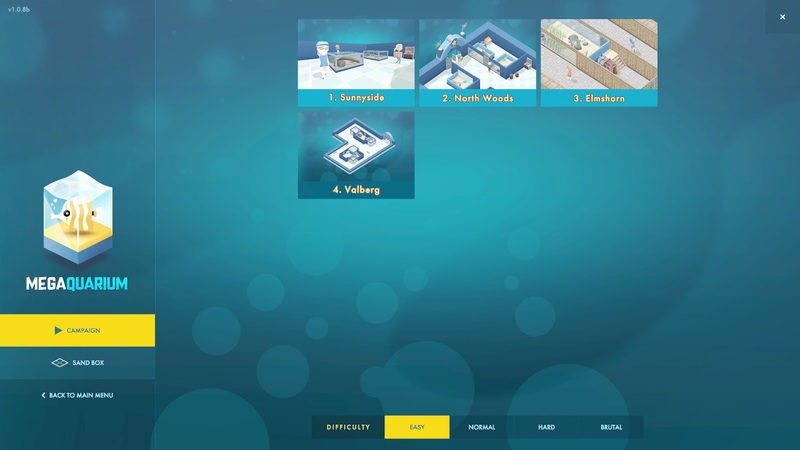 The option of either starting a new aquarium once you have unlocked it or carrying on with the one you have been working on is a cool feature, I currently have 4 different aquariums; Sunnyside, North Woods, Elmshorn and Valberg and out of all of them I prefer Elmshorn as I love the bamboo decorations and it feels much more unique. I'm not sure how many aquariums you can unlock in total but once I find out I will update this post. I give this game 4/5 stars, would be 5 if the loading time was quicker! 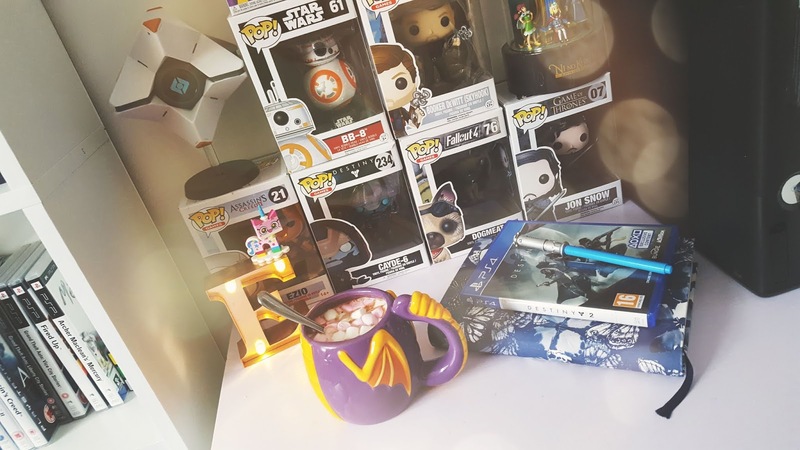 Top 5 Female Hero and Villain's in Video Games.